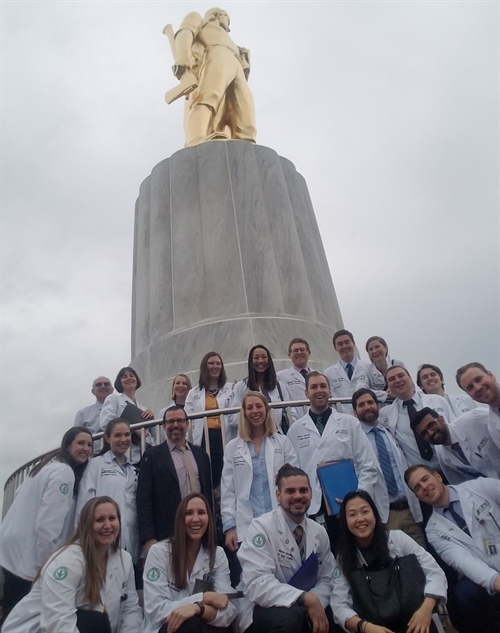 House Bill 3342: An OPSO sponsored bill that would require hospitals, certain healthcare facilities and prisons in Oregon to provide healthy, plant-based meals when meals are served. 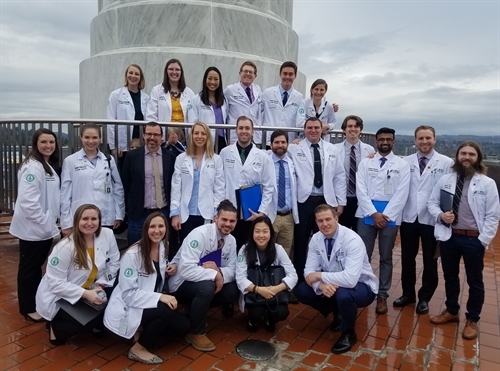 House Bill 3011: Expanding access for osteopathic medical students to the Scholars for a Healthy Oregon scholarship program. The day began with a visit from representative Ron Noble (R-McMinnville) fielding questions from attendees discussing a variety of healthcare legislation being consider this year including mandated vaccinations for Oregon children entering public school and several pharmaceutical pricing bills and legislation impacting pharmacy benefit managers. Attendees then visited individual legislator offices with a final group visit with representative Sherrie Spregner (R-Lebanon/Scio) where attendees discussed the outcomes of their meetings and explored the legislative priorities and interests with representative Sprenger. The day ended with a tour atop the capitol dome to view the Oregon Pioneer, with a final visit to a local restaurant for well-deserved (and healthy of course) refreshments. 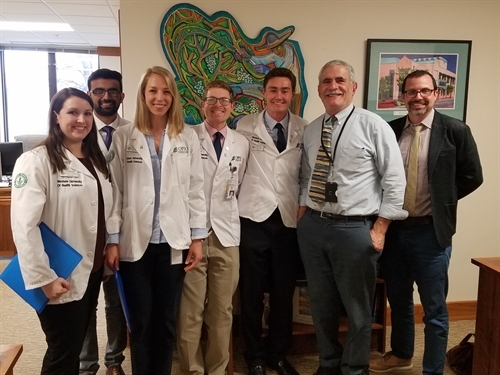 Special thanks to the OPSO Council of Medical Students,Dayton Dean, William Crowler, Alisha Harrington and Patricia Nguyen for helping to organize the event, and to all the attendees - Kristina Bueter OMS, Ashley Curran OMS, Romil Patel OMS, Ashlyn Lawson OMS, Sean Phillips OMS, Philip Shara OMS, Jessica Shen OMS, Luke Smith OMS, Justin Blaskowsky OMS, Daniel Carter OMS, Ashley McRoberts OMS, Ciara O'Driscoll OMS, Charles Ross, DO; Andrew Cox OMS, Julia Fischer OMS, Jeff Kerr OMS, Robin Richardson, DO; Nirusha Abeydeera OMS, Christina Kim OMS, Emily Lawrence OMS, and Tory Starzyk OMS.